The "Seven Summits" are the highest peaks on each of the seven continents. In the same spirit, this page lists the highest volcanoes on each continent. Two of these "Volcanic Seven Summits", Kilimanjaro and Elbrus, are also the highest mountains on their continents. In order to consider two peaks as distinct volcanoes, this list requires that they have erupted from separate vents and each have 1000 feet (305 m) of prominence (reascent) above any intervening pass. This is a rather strict standard, but it helps eliminate most subsidiary summits and satellite cinder cones from the list. For example, the twin summits of Elbrus have erupted from separate vents, but the lower East Peak has only 296 m (970 ft) of prominence above the saddle separating it from the higher West Peak, so it is not listed separately. The two summits of Kilimanjaro are however listed separately, since the lower peak (Mawenzi) has about 850 m (2800 ft) of prominence above the saddle separating it from the much higher Kibo. This makes Mawenzi the third highest volcano and peak in Africa. This list defines the continents based on geological or geographical terms instead of geopolitical or cultural. Primarily, the continents are defined based on their continental shelves, for example this ensures that the island of New Guinea is included as part of the Australian continent. In the case of Eurasia, which is really a single continent geologically, the split into Europe and Asia is made geographically along the crests of the Ural and Caucasus mountain ranges. This splits the country of Georgia between the two continents since it lies across the Caucasus divide (although mostly on the Asian side), while Armenia lies entirely to the south of the divide in Asia. The volcano Kazbek is in Georgia but on the European side of the divide, while Aragats in Armenia is far on the Asian side. The Canary Islands (controlled by Spain) are part of Africa geographically, so Pico del Teide is on the Africa list (although many people object to this). Countries can obviously have portions in more than one continent (e.g. Russia, Turkey), so I'm not sure why many people are opposed to according Spain the same multi-continent status. Spain has small territories, Ceuta and Melilla, on the North African mainland, so it is already a multi-continent nation irrespective of the Canary Islands. Ignoring any political and cultural issues is really the only correct way to define the continents, because otherwise a change in political status would result in having to redefine the continents and rewrite the lists. I'm not sure why some people are so hung up on defining continents based on political considerations, it makes little sense. Here's an illustrative example to prove the point: If Tanzania were still part of the British Empire, would these same people consider Kilimanjaro the highest peak in Europe? Hopefully not, that would be absurd. And that's why geology and/or geography are the proper ways to go about defining the continents. 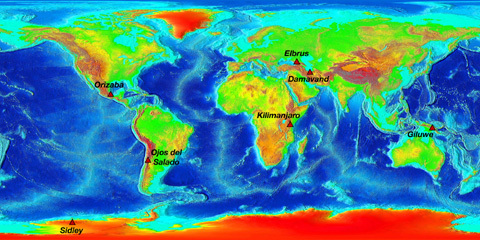 Major updates in 2007 include a complete revision of the Oceania section, recognizing that Mount Giluwe is the highest volcano, not Mauna Kea. This should have been fixed a couple of years ago, I apologize for that. I had heard that Giluwe was a volcano and therefore the highest in Oceania, but did not have the time to verify for certain until recently, when I researched and read several old scientific papers about Giluwe and other Papua New Guinea volcanoes. As a bonus from that research, I've also added 9 more PNG volcanoes for a much more complete listing, although some may still be missing. In the South America section, Mercedario is now unranked, since it is most likely not a volcano. And Kazbek is now in the Europe section instead of Asia, since it is north of the Caucasus divide which locally runs through Krestovy Pass, 14 miles (22 km) south of Kazbek. Several relevant footnotes are in the right column below. Anyway, enough discussion, on to the list. I have compiled this list myself using a variety of sources both on the web and in print, and as far as I know, this was the first list of the Volcanic Seven Summits ever published online or in print. However, it is likely that there are still some errors and some volcanoes which should be included are missing. If you find any errors or omissions, please contact me. Thanks to the several people who have pointed out the errors over the years. Is this page TOO WIDE for your browser? Click here to view a narrower version. 25. Jocotitlan 12960 ft 3950 m Mexico 1. There are numerous volcanoes and volcanic peaks in Mexico above 12000 ft (3600 m) elevation, and their elevations are not accurately known in many cases, at least as shown on available maps. Thus there may be several inaccuracies or even omissions of Mexican volcanoes on this list. Cerro Mercedario 22210 ft 6770 m Chile / Argentina Probably uplifted volcanic rock, but not a volcano; reliable info is scarce. 7. Nevado de Incahuasi 21722 ft 6621 m Chile / Argentina 2. The elevations of many of the high peaks in South America are not well known, with widely differing values given in various sources. Thus there are certain to be numerous inaccuracies and omissions on this list, and it is not easy to correct these deficiencies or to rectify conflicting sources. In particular, some references state that Ojos del Salado's elevation is only 22520 ft (6864 m), which would make Monte Pissis the highest volcano in the world (and the second highest peak in South America) if the listed height is accurate. But newer sources give the height of Pissis as only 6793 m, and the NASA radar mapping confirms that Ojos is roughly 100 m higher than Pissis. (see Note 3 at right) 1. Damavand 18603 ft 5670 m Iran 3. There are several scattered volcanic centers located in Tibet and western China which lie at elevations of 17700-19000 ft (5400-5800 m), potentially placing some of them in contention for the honor of highest volcano in Asia over Iran's Damavand. However, these very minor volcanic cones are unlikely to meet any reasonable mountaineering standard of prominence (such as 1000 ft / 305 m used here), and thus they have been excluded from this list. This list seeks to include real volcanic mountains, not minor outpourings of lava that happened to leak to the Earth's surface in high-elevation regions. (see Note 4 and 5 at right) 1. Kilimanjaro (Kibo) 19340 ft 5895 m Tanzania 4. The Canary Islands lie on the edge of the African Plate, and even a casual glance at a map shows that they must be considered part of Africa, lying less than 100 miles off its west coast. Despite this fact, many volcanological books and references group them with Europe instead of Africa because they are controlled by Spain, thus listing Pico del Teide as the third highest volcano in Europe. This erroneous confusion of political control with geographical fact will not be repeated here, and so the Canary Islands are listed as part of Africa.
? 13. Gahinga 11398 ft 3474 m Uganda / Rwanda 5. There may be other African volcanoes between 11000 and 12000 ft (3300–3600 m) elevation which are missing from this list. Further research is needed. (see Note 6 below right) 1. Mount Giluwe 14331 ft 4368 m Papua New Guinea Mount Giluwe page is coming soon. 5. Mount Ne 11926 ft 3635 m Papua New Guinea Elevation data is very unreliable. 7. Mount Ialibu 11365 ft 3465 m Papua New Guinea Elevation data is unreliable. 8. Mount Kerewa 11706 ft 3568 m Papua New Guinea Elevation data is very unreliable. 14. Mount Suaru 8750 ft 2667 m Papua New Guinea Elevation data is unreliable. 15. Mount Sisa 8694 ft 2650 m Papua New Guinea Elevation data is unreliable. 16. Mount Karimui 8417 ft 2566 m Papua New Guinea Elevation data is unreliable. 19. Mount Bosavi 8225 ft 2507 m Papua New Guinea Elevation data is unreliable. 20. Ulawun 7658 ft 2334 m New Britain (PNG) 6. The "continent" of Oceania is a geographer's convenience, consisting of Australia and the various island groups of the central and south Pacific, including Melanesia, Micronesia, and Polynesia. Hawaii is a part of Polynesia and thus must be included in Oceania, not North America. Many volcanological books and references group Hawaii with North America for obvious reasons of convenience, but this is not geographically accurate since the islands lie about 2500 miles (4000 km) off the coast of North America. For the purposes of this list, the island of New Guinea (including Irian Jaya) is considered part of Oceania, while the remainder of Indonesia is part of Asia. This is the only correct division, since the entire island of New Guinea lies on the continental shelf of Australia, and thus it is as an integral part of the continent of Australia/Oceania, just as Britain is of the continent of Europe. (This also agrees with standard mountaineering practice in regards to determining the Seven Summits, whereby Puncak Jaya is considered the highest peak in Oceania over Australia's Mount Kosciusko). Unlike Puncak Jaya and the other highest peaks of New Guinea which are non-volcanic, Mount Giluwe is an old eroded volcano and thus is the highest volcano in Oceania.